Belarus Free Theatre is celebrating 10 years’ work with Staging a Revolution, a London showcase of the brand of underground theatre that has cut such a swathe through Europe and North America over the past decade. The fanfare and glitz aside, the festival is also a timely opportunity to witness the hard work BFT has put in to earn its accolades, its artistic vision fired, rather than dampened, by spending the past five years in enforced exile. It is an observation shared by fellow directors Natalia Kaliada and Vladimir Shcherban who, along with Khalezin, founded the company. Within only a year of kicking off with Sarah Kane’s 4.48 Psychosis in 2005, BFT was busy touring internationally and winning over audiences, with its first original work Being Harold Pinter following two years later. However, back home the reaction was very different. 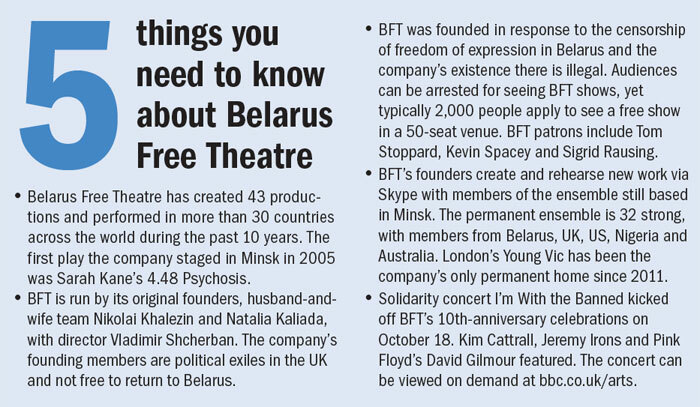 The mere fact of its existence caused problems for the company from the outset, because it decided to operate outside the official state theatre system in Belarus – the former Soviet republic today described as Europe’s last dictatorship. 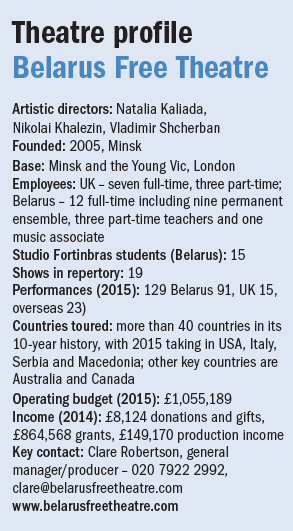 Aggravated by increasing exposure abroad and BFT’s perceived political agenda (more of that later), increasingly oppressive measures by the Belarusian authorities forced the company’s artistic directors to flee to the UK, where David Lan offered them a permanent home at the Young Vic in 2011. Kaliada says: “That’s why we didn’t even get registered as a theatre company – because it was clear we would get closed down. And anyway, we started as more than a theatre – we also started as an international competition for contemporary drama. The idea was to introduce our own playwrights, who were banned in Belarus, and at the same time introduce playwrights from the rest of the world to Belarusian audiences to show them how other countries live. It is certainly clear that there is something more than mere agitprop at work here when audience and cast alike are rounded up by the police for staging Edward Bond’s Eleven Vests, as happened in 2007, or when you lose your state job for directing Mark Ravenhill’s Some Explicit Polaroids, as happened to Shcherban. Using theatre to create change for all is the BFT’s real driving force, so unsurprisingly, education is another of the company’s founding pillars. Its first underground workshops in Belarus addressed taboos in society from a theatre perspective. By 2007, the workshops had achieved such a following that they were converted into a school, Studio Fortinbras – also underground – with an open call for young people who had not trained officially at the Belarusian State University of Culture and Arts. Even those without any performing arts experience were made welcome. And so BFT had to grow its own talent – from stage managers to directors to actors. The founders gave their time for free, and then, as the company’s reputation grew beyond its borders, they were able to appeal to supporters from abroad to come and teach too. The UK contingency of volunteers included the likes of Mark Ravenhill, Laura Wade, Alexandra Wood and Lyndsey Turner. Their visits helped them to share in the realities of life in Belarus, as Michael Attenborough experienced in Minsk when the workshop he was giving on Shakespeare was raided by the police. This year, funding has proved especially challenging, and the Staging a Revolution festival and its associated events have only been possible thanks to funders outside of the UK. As Khalezin says: “When we became a British company, that’s when the hardest problems arose, when people started to think that we are based here and we are not going anywhere else. We have had to face the fact that in the UK, experimental theatre isn’t guaranteed to get you gratitude or money. Operating in two countries involves two working days. When the day ends in London, the company goes on Skype to Minsk. It is a parallel reality that is reflected in Staging a Revolution, which is split into two programmes, with the first week staging shows across undisclosed venues in the spirit of BFT’s operation in its homeland, while the second week is an open celebration concentrated at the Young Vic – a reflection of BFT’s five years underground and five years in exile. The festival is therefore a record of the remarkable continuity and quality of work from the no-frills hyper-fringe attitude that has thrived through all the ups and downs, and Kaliada says if they had the chance there would be more shows in the programme. “We have had so many conversations about which productions we should add. Some of them have obviously been key moments in our development but there are others for which we specifically wanted to see the reaction of audiences.